We’d love your help. 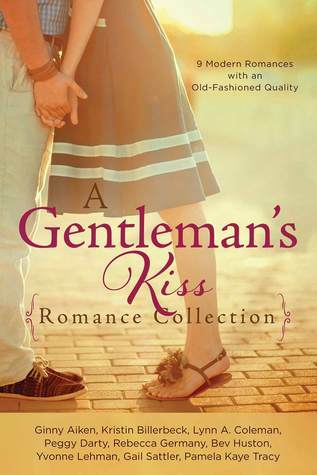 Let us know what’s wrong with this preview of A Gentleman's Kiss Romance Collection by Ginny Aiken. To ask other readers questions about A Gentleman's Kiss Romance Collection, please sign up. This book is exactly what it proclaims to be: old fashioned, sweet and clean, Christian fiction. Each novella is by a different author so each one is new and fresh. Ooh, and I love this cover. I don't know why but it just oozes sweet romance to me. I liked these books, but they were all a little slow going. So gentle that it was bordering on sleepy. It took me awhile to get through them all because it wasn't something I could read straight through like other novella anthologies I have read. I rea This book is exactly what it proclaims to be: old fashioned, sweet and clean, Christian fiction. Each novella is by a different author so each one is new and fresh. Ooh, and I love this cover. I don't know why but it just oozes sweet romance to me. I liked these books, but they were all a little slow going. So gentle that it was bordering on sleepy. It took me awhile to get through them all because it wasn't something I could read straight through like other novella anthologies I have read. I read one story here and there in between other books I was reading and it worked out well that way. A Gentleman's Kiss is a collection of old-fashioned romance stories by some of today's top writers. For a set of nice, feel-good books I would recommend it. However, I am not the type for the typical story where it is predictable where the story is going from the beginning. I do know that there are many people that look for this type of book and for them I would say definitely a good read. Especially if they enjoy Ginny Aiken, Kristin Billerbeck and the others. I was given this book by NetGalley a A Gentleman's Kiss is a collection of old-fashioned romance stories by some of today's top writers. For a set of nice, feel-good books I would recommend it. I am so excited for this book! I love the idea of old-fashioned romances set in today's world! I will definitely be picking up a copy after it's release. It will be the perfect Summer read! This is a series of novellas with quite a lot of Christianity & praying. They were cute, yet a couple were more preaching less romance. Still a fun little collection. I’m honestly not sure why I requested this book - I’m not typically a big fan of novellas, though I have read a few that were well written, they always feel too short. That opinion will definitely be reflected in my review. There were a couple times that I really wanted to skip to the next story, but despite that, I did read all of this book. I would kind of like to be able to review each story separately, because there were a few that I really enjoyed, while others I could have done without. Bu I’m honestly not sure why I requested this book - I’m not typically a big fan of novellas, though I have read a few that were well written, they always feel too short. That opinion will definitely be reflected in my review. There were a couple times that I really wanted to skip to the next story, but despite that, I did read all of this book. I would kind of like to be able to review each story separately, because there were a few that I really enjoyed, while others I could have done without. But then this review would be extremely long, so in lieu of that I’m going to do my best to give my overall thoughts and impressions. I actually did enjoy a few of the novellas in this collection, though probably half of them drove me crazy. I often felt like I was missing something, that too many things were being left out. This is why I don’t read novellas that often, unless they are part of a series. Actually, Kristin Billerbeck’s story is part of a series, though I have no idea which one. I think it is probably a little tack-on for fans who wanted to know what became of the last sibling/cousin. I’m honestly not sure why it was included, since I missed so much from having not read the other books. Overall, the authors all did a good job and each book has a sweet romance, along with an interesting spiritual aspect. A couple of the stories had very heavy spiritual themes that sometimes overwhelmed everything else. It’s very rare that I would like less of a spiritual note, but I could say that for a couple of the novellas. It probably would have been just right for a full length novel, but in this case, it was too much. Three of the stories actually go together and I think they may have been part of a set, prior to this collection. Something I would like to note, in case anyone else is under the impression that these are new novellas: they are all reprints, the newest being from 2004. It probably wouldn’t have bothered me as much, had I realized that sooner, but because I didn’t, every little thing drove me crazy. Most of them felt rather dated, though they are purported to be “modern.” I found this to be frustrating. I would have liked it much better, if the authors had gone over them and updated a couple things (for example, almost no one uses film in a camera, or goes to a film shop anymore, and most people have email and know how to use a computer). One of the nice things about this collection though, is that the characters don’t have as much modern technology and therefore aren’t interrupted by smart-phones or tablets. Most of the book is a blur in my mind, with the stories running together. I definitely wouldn’t recommend trying to read this in one sitting, or even two. This is something else that bothered me. Many of the characters weren’t unique enough to make them stand out in my mind. A couple of them are memorable, but the others are very stereotypical. I wanted each novella and their characters to catch my attention and imagination, but because most of them are probably less than 100 pages, it doesn’t allow much space for character development or descriptions. I can honestly recommend this book to anyone who really loves novellas. If you’re not much of a fan, like me, then I would suggest passing this one over. Or maybe just read one or two at a time, when you need a quick read between books. I received a complimentary copy of this book through NetGalley for my honest review, which I have given. I was not required to write a positive review and all opinions expressed are my own. What an apology from Rissa to Jase. Will he except it? What was up that Rissa forgets her birthday? What was the mystery of the two dogs that had been stolen? Will Mattie and Jeff get together after ten years has gone by and he has moved back to Heaven, Arizona? What's up with Jeff's sister...Joan and his nephew Kenny? What happens when Tyrone and Cassandra first meet? What happens after Melanie Roberts [from Ohio] meets Dave Browning [Atlanta] in Paris? Why had Melanie come to Paris? I love this quote: "Because of my grandmother." she answered. "I'm seeing Seine by moonlight or her." What will happen after Debby's grandmother gets her involved with Scott who was their next door neighbor by planting a garden that he thought to be on his property? What will happen when Melissa finds out she has gone out with the wrong guy Jeff [computer guy or was it Superman]her grandma had set her up with? Who had Melissa lost that she was so sad about? Why had Melissa thought that God had let her down? What did the song..'Seize the Day' mean to Melissa? Who had only called Melissa... Mel and now who was calling her that? What will happen when Ava and Georgio meet for the first time at her parents Alono's restaurant? Who will win Ava's heart? What happens when Sharmane is caught in a Shower and takes cover under a tree and Alex comes to the her rescue? Why did Alex not want Sharmane to know who he really was? Had Sharmane finally found Mr Right? back there...a place Rebecca thought she would never return? Who was this Mason Clark at her new school at Shiloh Christian College? These were nine beautifully written Christian stories that were simply a wonderful novellas. To get all of the questions answered above you will have to pick up this novel and get it from each author's presentation. I found them all to be good reads. Here you have the hardest review I've ever had to write. This is a very personal thing, not sure everyone deals with it so I explain it: whenever I read a couple of very similar books in a row, I get fed up. It might be only me, but there are moments I've gone through a lot of fiction books, for example, that I have to stop and read nonfiction. That's how it works for me. So, reading nine short romantic stories was exhausting at times: so much love and dates and smiles for an entire decade. They s Here you have the hardest review I've ever had to write. So, reading nine short romantic stories was exhausting at times: so much love and dates and smiles for an entire decade. They seemed way, way too similar. I've figuered that a "collection" might not be my kind of book. Nevertheless, I'll try my best to say what I thought about it in spite of that, even though you can imagine this can cloud my judgement. There are nine stories. Nine! Is it fair to judge the collection as a whole when not everything applies to each novella except the fact that the cover is beautiful? I mean, three of them made me want to stop reading whatsoever, seriously, but then I thought: "Maybe next story is better and I'll miss it if I quit now", so I kept reading. It was good I read them all because I got to "Name that tune" by Yvonne Lehman (loved that one), "Sudden Showers" by Gail Sattler, and "Test of time" by Pamela Kaye Tracy. Those are lovely. Some novellas I didn't like at all because It's a novella, right? It's short. So, the story went from "I just met you" to "would you marry me?" going through a lot of "this has happened so fast". Of course it has! That's why it seemed so faked. In order to avoid that, other stories showed the couple had a past or imply they'll have a future together at some point, which made everything a bit more realistic. I'd encourage you to read it if you have time and like reading short stories and you are willing to give each novella a try knowing that some of them are not so good but you'd probably enjoy others. With this A-DORABLE cover, I was under the impression I’m in for nine sweetest than life novellas. What I got, and to be honest, I didn’t read through them all, is nine stories that felt, to varying degrees, like different preachings trying to convert me. I’m open to all faiths, and I rarely judge, but most of the stories in this compilation gave me the impression the stories were missing. There was very little (to none in some stories) romance, but a lot of weak willed characters who’s lives are With this A-DORABLE cover, I was under the impression I’m in for nine sweetest than life novellas. I’m open to all faiths, and I rarely judge, but most of the stories in this compilation gave me the impression the stories were missing. There was very little (to none in some stories) romance, but a lot of weak willed characters who’s lives are dictated by a higher power. I do have to say that in most of the stories the writing itself was excellent, and for those of you enjoying this genre of Christian stories – I’d recommend this collection. * I received this title for review from Barbour Books via NetGalley. (Thank you to Barbour Books for a copy of the book in exchange f I struggled through this collection of novellas. While the premise of each story was somewhat interesting, I found the dialogue to be either cheesy, stilted, preachy, immature, or unrealistic. Some were so slow paced they lost my interest, while others moved the plot forward in ways that seemed contrived. I loved the cover of the book and thought it gave the impression that the stories would be more romantic than I found them to be. I have read a number of Novella collections lately and perhaps I am burnt out on these light short romances. I felt like these were a bit of a slog. They took me a long time to get through. They were sweet and clean but they all seemed the same. There were slight variations but not enough to make them each very memorable. These were also a bit heavy handed on the spiritual or religious. It seemed a bit overdone for such short stories. I think those themes come across better when you have more ti I have read a number of Novella collections lately and perhaps I am burnt out on these light short romances. I felt like these were a bit of a slog. They took me a long time to get through. They were sweet and clean but they all seemed the same. There were slight variations but not enough to make them each very memorable. These were also a bit heavy handed on the spiritual or religious. It seemed a bit overdone for such short stories. I think those themes come across better when you have more time to really get to know the characters and have awhile to watch the story unfold. I really enjoyed reading this book. These nine stories were interesting and relaxing. They were also nice and short. The perfect break to read before bed or between daily tasks. Some of the stories were about the same group of people focussing on different members of the group which was nice. I’ve always enjoyed series like that. Ginny Aiken, a former newspaper reporter, lives in Pennsylvania with her husband and their three younger sons--the oldest is married, has flown the coop, and made her a doting grandmother. Born in Havana, Cuba, and raised in Valencia and Caracas Venezuela, Ginny discovered books at an early age. She wrote her first novel at age fifteen while she trained with the Ballets de Caracas, later to be kno Ginny Aiken, a former newspaper reporter, lives in Pennsylvania with her husband and their three younger sons--the oldest is married, has flown the coop, and made her a doting grandmother. Born in Havana, Cuba, and raised in Valencia and Caracas Venezuela, Ginny discovered books at an early age. She wrote her first novel at age fifteen while she trained with the Ballets de Caracas, later to be known as the Venezuelan National Ballet. She burned that tome when she turned a "mature" sixteen. An ecletic list of jobs--including stints as reporter, paralegal, choreographer, language teacher, retail salesperson, wife, mother of four boys, and herder of their numerous and assorted friends, including the 135 members of first the Crossmen and then the Bluecoats Drum & Bugle Corps--brought her back to books in search of her sanity. She is now the author of twenty-seven published works, but she hasn't caught up with that elusive sanity yet.